As I'm sure most of y'all know decorating for fall is so easy because mother nature provides us with her fall splendor. We just have to bring it in. I've been adding fall's bounty here and there in each room and today I'm sharing the great room/family room. This is the largest room in the house with the back wall of windows that will display fall colors in a few weeks when the trees change. One of the easiest ways to update seasonally is changing out pillows so I brought my large fall leaves pillow back out. Mr. owl is glad to come out of hiding, too. I don't think I have shown y'all my large old flower basket I found in Florida. I have filled it with a live ivy plant, a greenish blue pumpkin and my favorite squirrel. I don't care for the real squirrels that chew on our house, but this one is harmless. I went to the pumpkin farm last week and bought some colorful pumpkins to use. This one was in with the blue pumpkins, but was rather green and I knew it would be perfect in this room. The trapper's basket I just found last Friday is filled with fall foliage and sits on the sofa table in place of the huge demijohn that was there. Of course the leaves are not real, but they sure do look real, don't they? I bought them at the same place as the basket. The trees haven't changed much here yet. A small change has been made to the mantel since I shared it. I added the painted candlesticks that I made over and removed the French bread basket of apples. On the other side of the room I replaced the ivy plant in the urn with this blush colored pumpkin and added the vine for more texture. A stack of old books, binoculars, a cute gourd and a silver pitcher filled with wheat and grasses finish out the vignette. Oh, and the dried hydrangeas in the fireplace seem to stay there. 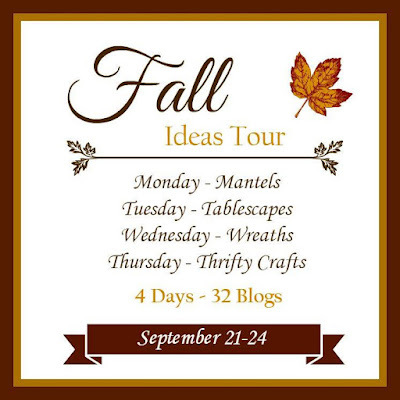 Today is the first day of a new fall tour and it's all about some ideas and inspiration with a new theme each day and eight different bloggers a day. Today it is all about mantels. I hope y'all will click the links below to be inspired. Tomorrow is my tour day so I hope you'll come back. Check out my great room from last fall here. Looks great Kim...love the vignette on your green buffet! Love the room dressed for Fall....from the gorgeous pillows to the fabulous vignettes...and love the new basket!!! Kim, I just love your southern charm, its lovely. Kim, Fall is my favorite time of the year! I love seeing your Fall decor! Everything looks fabulous! Kim, I see how you used your basket, didn't realize that I am a day behind reading my blogs. I love how you used everything to make your room as fall and as yet natural as you did. Very nice, Kim! Love the arrangement of the basket on the table, and the new trapper basket is much bigger than I thought (yes, those leaves look real!). We noticed on our walk this morning, our trees seemed to have gotten more color just overnight. It's been so dry I'm afraid the leaves are going to drop quick. Have a good week. Love the pillows and all the other accessories. Your rooms work so well with the fall colors! So pretty! Your room looks so warm and welcoming and I really love your trapper's basket full of beautiful fall leaves. Great job! Your great room looks wonderful all dressed up for fall. Love the color of pumpkins you chose. Perfect as always. In love with your trapper basket find and those leaves just makes perfect sense there! Love your fall touches Kim. Everything looks so beautiful! I love the colors of your pumpkins. I hope you will share with us at the Thursday Favorite Things Blog Hop! Everything looks so pretty and Fallish, Kim! The owl and leaves pillows are beautiful, and I love the big bunch of Fall leaves.....yes, they do look real! The room looks so pretty for fall. Love all the pretty fall colors in your decor. I love that new basket and how you filled it. I just found a bluish green pumpkin yesterday, I had been searching for one for my stack:) The basket on the coffee table looks great! I love this room, please share the view out the windows when the leaves do change. I really miss seing them, but NOT the mess!!!! I wondered how you were going to use your new trapper's basket! It looks gorgeous where you placed it, and those leaves do look very realistic! *note to self-must grow green and blush colored pumpkins next year! Your wood floors just glow! Your living room is perfect for Fall and your touches set it off so pretty. Your family room looks so pretty all decked out for Fall! I love your basket with the Fall leaves and the cute pillows on your sofa. I need to find some vine like you have. I love it. Kim, it all looks gorgeous! Oh, I wish fall was here in any shape or form in Southern California. I'm trying to tempt it by adding autumn touches around our home. No pumpkins yet, too hot, they would surely cook themselves on the spot. But I'm hoping for that snap of fall. In the meantime, I've really enjoyed looking at your fall decorating, thank you for sharing! Your room looks so pretty all spruced up with pumpkins! I love that owl pillow, where is it from? Angelina, I got that a couple years ago on Joss & Main. Kim, as always your home is perfection! Oh, that blush colored pumpkin is just stunning! I've never seen one like it before. So so pretty! I love how you mixed the more modern pillows with your French inspired style. They really look amazing. Perfect balance of French and fall! Your home is so beautiful Kim! I love all of the reds, that adorable owl pillow, the cute little squirrel! I could go on and on! This is so beautiful, Kim! All the little special touches makes your house your home. The squirrel with all the acorns is so darn cute. Love the basket with the colourful foliage! I had to come back to this post after I was surfing just now on the One King's Lane website and came across an item nearly identical to the one that I knew I'd seen here on your blog. They call it a "pack basket", but it's essentially the same as your recent trapper's basket find. Theirs is "vintage", too, but I'm betting yours was nowhere near $495! I'd provide a link, but readers must to enter their email info to access the site. It's currently offered in their "Into the Woods" collection of outdoor-inspired items, so you can try Googling it - this one is a darker brown with tan webbing. They've offered others, apparently, in other shades for more than $500, so what a great coup for you! Well done! Leslie, I found that on their site a few days ago and was shocked at the price. I paid only $60!! I knew I got a good deal. No way would I pay that crazy price on OKL.